Here are some facts about the F distribution. Let’s return to the slicing tomato exercise in [link]. The means of the tomato yields under the five mulching conditions are represented by μ1, μ2, μ3, μ4, μ5. We will conduct a hypothesis test to determine if all means are the same or at least one is different. Using a significance level of 5%, test the null hypothesis that there is no difference in mean yields among the five groups against the alternative hypothesis that at least one mean is different from the rest. Probability Statement:p-value = P(F > 4.481) = 0.0248. Conclusion: At the 5% significance level, we have reasonably strong evidence that differences in mean yields for slicing tomato plants grown under different mulching conditions are unlikely to be due to chance alone. We may conclude that at least some of mulches led to different mean yields. Press STAT, and arrow over to TESTS, and arrow down to ANOVA. Press ENTER, and then enter L1, L2, L3, L4, L5). Press ENTER. You will see that the values in the foregoing ANOVA table are easily produced by the calculator, including the test statistic and the p-value of the test. MRSA, or Staphylococcus aureus, can cause a serious bacterial infections in hospital patients. [link] shows various colony counts from different patients who may or may not have MRSA. 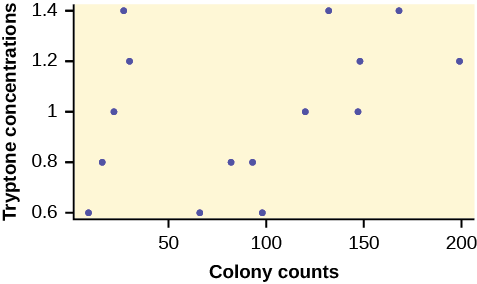 Test whether the mean number of colonies are the same or are different. Construct the ANOVA table (by hand or by using a TI-83, 83+, or 84+ calculator), find the p-value, and state your conclusion. Use a 5% significance level. While there are differences in the spreads between the groups (see [link]), the differences do not appear to be big enough to cause concern. The one-way ANOVA table results are shown in [link]. Probability Statement:p-value = P(F > 0.6099) = 0.6649. Make a decision: Since α > p-value, we do not reject H0. Conclusion: At the 5% significance level, there is insufficient evidence from these data that different levels of tryptone will cause a significant difference in the mean number of bacterial colonies formed. Four sororities took a random sample of sisters regarding their grade means for the past term. The results are shown in [link]. Four sports teams took a random sample of players regarding their GPAs for the last year. The results are shown in [link]. Use a significance level of 5%, and determine if there is a difference in GPA among the teams. With a p-value of 0.9271, we decline to reject the null hypothesis. There is not sufficient evidence to conclude that there is a difference among the GPAs for the sports teams. A fourth grade class is studying the environment. One of the assignments is to grow bean plants in different soils. Tommy chose to grow his bean plants in soil found outside his classroom mixed with dryer lint. Tara chose to grow her bean plants in potting soil bought at the local nursery. Nick chose to grow his bean plants in soil from his mother’s garden. No chemicals were used on the plants, only water. They were grown inside the classroom next to a large window. Each child grew five plants. At the end of the growing period, each plant was measured, producing the data (in inches) in [link]. Does it appear that the three media in which the bean plants were grown produce the same mean height? Test at a 3% level of significance. This time, we will perform the calculations that lead to the F’ statistic. Notice that each group has the same number of plants, so we will use the formula F’ = . Then MSbetween = = (5)(0.413) where n = 5 is the sample size (number of plants each child grew). Conclusion: With a 3% level of significance, from the sample data, the evidence is not sufficient to conclude that the mean heights of the bean plants are different. *Arrow down to Fcdf(and press ENTER. Another fourth grader also grew bean plants, but this time in a jelly-like mass. The heights were (in inches) 24, 28, 25, 30, and 32. Do a one-way ANOVA test on the four groups. Are the heights of the bean plants different? Use the same method as shown in [link]. 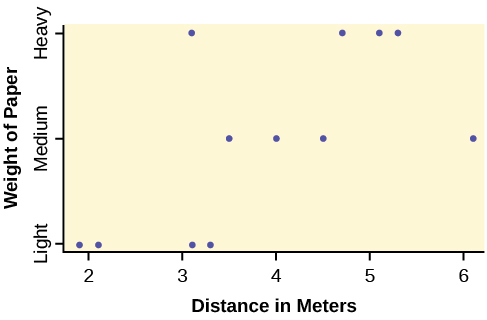 From the sample data, the evidence is not sufficient to conclude that the mean heights of the bean plants are different. From the class, create four groups of the same size as follows: men under 22, men at least 22, women under 22, women at least 22. Have each member of each group record the number of states in the United States he or she has visited. Run an ANOVA test to determine if the average number of states visited in the four groups are the same. Test at a 1% level of significance. Use one of the solution sheets in [link]. Data from a fourth grade classroom in 1994 in a private K – 12 school in San Jose, CA. Hand, D.J., F. Daly, A.D. Lunn, K.J. McConway, and E. Ostrowski. A Handbook of Small Datasets: Data for Fruitfly Fecundity. London: Chapman & Hall, 1994. Hand, D.J., F. Daly, A.D. Lunn, K.J. McConway, and E. Ostrowski. A Handbook of Small Datasets. London: Chapman & Hall, 1994, pg. 50. Hand, D.J., F. Daly, A.D. Lunn, K.J. McConway, and E. Ostrowski. A Handbook of Small Datasets. London: Chapman & Hall, 1994, pg. 118. “MLB Standings – 2012.” Available online at http://espn.go.com/mlb/standings/_/year/2012. Mackowiak, P. A., Wasserman, S. S., and Levine, M. M. (1992), “A Critical Appraisal of 98.6 Degrees F, the Upper Limit of the Normal Body Temperature, and Other Legacies of Carl Reinhold August Wunderlich,” Journal of the American Medical Association, 268, 1578-1580. 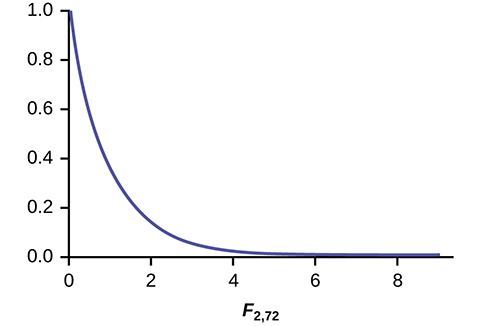 The graph of the F distribution is always positive and skewed right, though the shape can be mounded or exponential depending on the combination of numerator and denominator degrees of freedom. 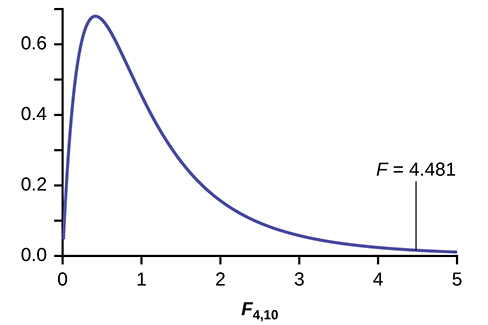 The F statistic is the ratio of a measure of the variation in the group means to a similar measure of the variation within the groups. If the null hypothesis is correct, then the numerator should be small compared to the denominator. 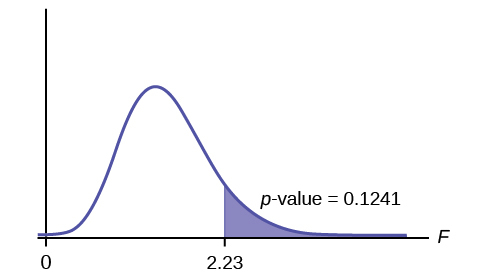 A small F statistic will result, and the area under the F curve to the right will be large, representing a large p-value. When the null hypothesis of equal group means is incorrect, then the numerator should be large compared to the denominator, giving a large F statistic and a small area (small p-value) to the right of the statistic under the F curve. When the data have unequal group sizes (unbalanced data), then techniques from [link] need to be used for hand calculations. In the case of balanced data (the groups are the same size) however, simplified calculations based on group means and variances may be used. In practice, of course, software is usually employed in the analysis. As in any analysis, graphs of various sorts should be used in conjunction with numerical techniques. Always look of your data! An F statistic can have what values? What happens to the curves as the degrees of freedom for the numerator and the denominator get larger? 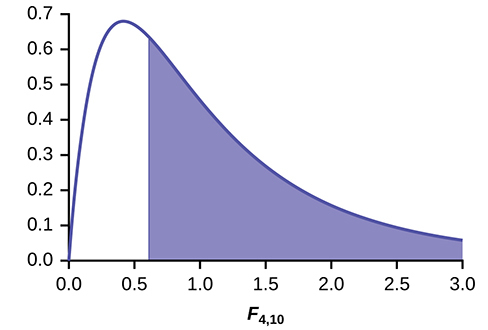 The curves approximate the normal distribution. Use the following information to answer the next seven exercise. Four basketball teams took a random sample of players regarding how high each player can jump (in inches). The results are shown in [link]. What are the Sum of Squares and Mean Squares Factors? What are the Sum of Squares and Mean Squares Errors? At the 5% significance level, is there a difference in the mean jump heights among the teams? What are the SSbetween and MSbetween? What are the SSwithin and MSwithin? At the 10% significance level, are the scores among the different groups different? Yes, there is enough evidence to show that the scores among the groups are statistically significant at the 10% level. Enter the data into your calculator or computer. State the decisions and conclusions (in complete sentences) for the following preconceived levels of α. Use a solution sheet to conduct the following hypothesis tests. The solution sheet can be found in [link]. Three students, Linda, Tuan, and Javier, are given five laboratory rats each for a nutritional experiment. Each rat’s weight is recorded in grams. Linda feeds her rats Formula A, Tuan feeds his rats Formula B, and Javier feeds his rats Formula C. At the end of a specified time period, each rat is weighed again, and the net gain in grams is recorded. Using a significance level of 10%, test the hypothesis that the three formulas produce the same mean weight gain. Decision: Do not reject null hypothesis; Conclusion: There is insufficient evidence to conclude that the means are different. A grassroots group opposed to a proposed increase in the gas tax claimed that the increase would hurt working-class people the most, since they commute the farthest to work. Suppose that the group randomly surveyed 24 individuals and asked them their daily one-way commuting mileage. The results are in [link]. Using a 5% significance level, test the hypothesis that the three mean commuting mileages are the same. Examine the seven practice laps from [link]. Determine whether the mean lap time is statistically the same for the seven practice laps, or if there is at least one lap that has a different mean time from the others. At least two mean lap times are different. Decision: Do not reject null hypothesis; Conclusion: There is insufficient evidence to conclude that the mean lap times are different. Use the following information to answer the next two exercises. [link] lists the number of pages in four different types of magazines. Using a significance level of 5%, test the hypothesis that the four magazine types have the same mean length. Eliminate one magazine type that you now feel has a mean length different from the others. Redo the hypothesis test, testing that the remaining three means are statistically the same. Use a new solution sheet. Based on this test, are the mean lengths for the remaining three magazines statistically the same? At least any two of the magazines have different mean lengths. Conclusion: There is sufficient evidence to conclude that the mean lengths of the magazines are different. A researcher wants to know if the mean times (in minutes) that people watch their favorite news station are the same. Suppose that [link] shows the results of a study. Are the means for the final exams the same for all statistics class delivery types? [link] shows the scores on final exams from several randomly selected classes that used the different delivery types. At least two of the means are different. Conclusion: The mean scores of different class delivery are not different. Are the mean number of times a month a person eats out the same for whites, blacks, Hispanics and Asians? Suppose that [link] shows the results of a study. Are the mean numbers of daily visitors to a ski resort the same for the three types of snow conditions? Suppose that [link] shows the results of a study. At least any two of the means are different. Conclusion: There is not sufficient evidence to conclude that the mean numbers of daily visitors are different. Sanjay made identical paper airplanes out of three different weights of paper, light, medium and heavy. He made four airplanes from each of the weights, and launched them himself across the room. Here are the distances (in meters) that his planes flew. Take a look at the data in the graph. Look at the spread of data for each group (light, medium, heavy). Does it seem reasonable to assume a normal distribution with the same variance for each group? Yes or No. Why is this a balanced design? Calculate the sample mean and sample standard deviation for each group. Does the weight of the paper have an effect on how far the plane will travel? Use a 1% level of significance. Complete the test using the method shown in the bean plant example in [link]. DDT is a pesticide that has been banned from use in the United States and most other areas of the world. It is quite effective, but persisted in the environment and over time became seen as harmful to higher-level organisms. Famously, egg shells of eagles and other raptors were believed to be thinner and prone to breakage in the nest because of ingestion of DDT in the food chain of the birds. The values are the average number of eggs laid daily for each of 75 flies (25 in each group) over the first 14 days of their lives. Using a 1% level of significance, are the mean rates of egg selection for the three strains of fruitfly different? If so, in what way? Specifically, the researchers were interested in whether or not the selectively bred strains were different from the nonselected line, and whether the two selected lines were different from each other. The data appear normally distributed from the chart and of similar spread. There do not appear to be any serious outliers, so we may proceed with our ANOVA calculations, to see if we have good evidence of a difference between the three groups. Ha: μi ≠ μj some i ≠ j. Define μ1, μ2, μ3, as the population mean number of eggs laid by the three groups of fruit flies. Decision: Since the p-value is less than the level of significance of 0.01, we reject the null hypothesis. Conclusion: We have good evidence that the average number of eggs laid during the first 14 days of life for these three strains of fruitflies are different. Interestingly, if you perform a two sample t-test to compare the RS and NS groups they are significantly different (p = 0.0013). Similarly, SS and NS are significantly different (p = 0.0006). However, the two selected groups, RS and SS are not significantly different (p = 0.5176). 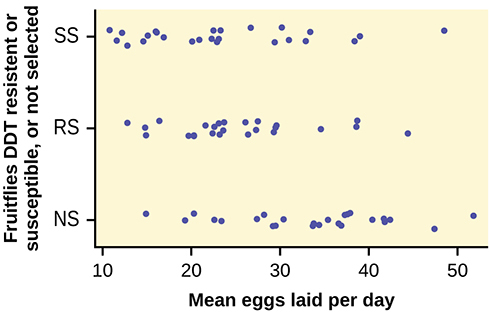 Thus we appear to have good evidence that selection either for resistance or for susceptibility involves a reduced rate of egg production (for these specific strains) as compared to flies that were not selected for resistance or susceptibility to DDT. Here, genetic selection has apparently involved a loss of fecundity. The data shown is the recorded body temperatures of 130 subjects as estimated from available histograms. Traditionally we are taught that the normal human body temperature is 98.6 F. This is not quite correct for everyone. Are the mean temperatures among the four groups different? Calculate 95% confidence intervals for the mean body temperature in each group and comment about the confidence intervals. Facts About the F Distribution by OpenStaxCollege is licensed under a Creative Commons Attribution 4.0 International License, except where otherwise noted.